Description: Detailed large political map of Massachusetts showing cities, towns, county formations, roads highway, US highways and State routes. 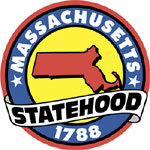 Massachusetts in the east is the gateway to New England and a state rich in historical events and modern technology. Visitors will find quaint cobble-stoned streets in villages or towns lined with 18th century houses to the modern Boston Skyline viewed from the top of the Prudential Tower as well as the oldest university in the USA, Harvard University in Cambridge. Massachusetts is where the first pilgrims arrived, where the Mayflower dropped anchor in 1620 and where the Boston Tea party sparked the American Revolution in 1773. This state is rich in historical sites and museums recalling the events of the New World and is also one of the original 13 states. The Berkshire Hills sprawl across the west of Massachusetts, while in the east the hills reach down to the sea and to the beaches of Cape Cod. During April to October nature lovers can enjoy the fascinating experience of whale watching, for this is one of the top 10 whale-watching sites in the world. Other interesting towns are Salem, with its famous witch trials during 1692, Concord, one of the most beautiful and historical towns in the USA and of course Boston with its many museums, art galleries and historical museums and sites. The climate is sunny and warm from May to October and winters are cold. The autumn is particularly beautiful, with its Indian summer mild temperatures and colors springing from the leaves of a variety of hardwoods. Physical map and map image of Massachusetts.